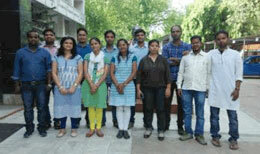 Orientation of trainees is an integral part of SRIJANs Induction program. Every year, new joiners undergo a one year long induction training to become a development professional. This year total of 12 trainees joined us in June and August 2016 respectively for whom two days orientation event was organized at New Delhi. The orientation program happens to be on the day 1 of joining with an objective to make the new joiners understand about their new roles and organization work culture through various participatory sessions. The trainees also gain a deeper understanding on development and development sector through the dialogues of experts from the development world. This year, the experts were Mr. Kailash Hariharan Iyer, Joint Director, FICCI and Mr. Shalabh Mittal, CEO, SSE India..